When you remove the counterbalance gear from a ZX14 crankshaft there's no point in keeping the heavy counterbalancer mechanisms in the crankcase. 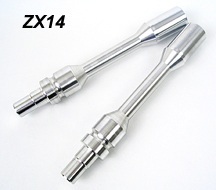 You can replace both balancer assemblies with these lightweight billet aluminum "dummy" shafts. Remove the stock assemblies and insert these shaft in their place. The precision-machined shaft blocks all oil passages. Precision CNC machined billet aluminum. Price includes a pair (two) shafts.